Polycrystalline Diamond Compact, also known as PDC, composes of polycrystalline diamond layer and carbide substrate, is one kind of super hard composite material which is sintered under the condition of high temperature and pressure. PDC has excellent abrasion resistance, good impact resistance and thermal stability. It has been widely used in production of oil drill bits, coal and other geological drill bits and cutting tools. 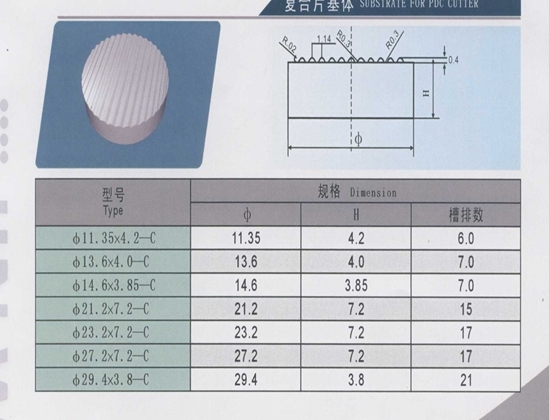 Tungsten carbide substrate is an indispensable part of PDC. We produce a broad range of carbide PDC substrates that are suitable for various PDC. Our company also provides custom sizes to meet non-standard requirements. This tungsten carbide substrate is used for making PDC drill bits and oil-field diamond compact, such as oil or gas drill bit, rock drill and coal mining drill bit, and also could be used for diamond tools for cutting, grinding, polishing. Carbide PDC substrate are mainly used for making PDC for mining and for machinery tools. 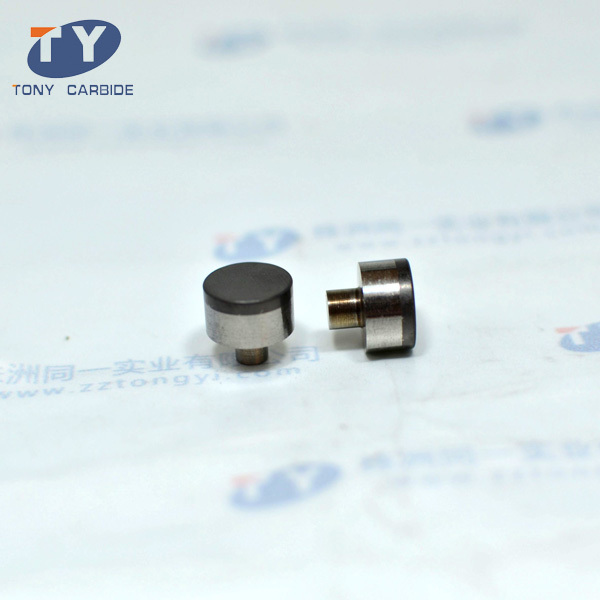 This tungsten carbide substrate is suitable for geological drilling coal and soft or medium hard rock formations. It has a high resistance to impact toughness and thermal stability. The maximum heat-restraint temperature can be up to 750°c (two minutes). With higher hardness, wear resistance and cutting precision, PDC substrate is suitable for cutting high hardness alloy, wood and ceramic such as non-metallic, non-iron metal and metal materials. The types and shapes of tungsten carbide substrate can be designed by customers, such as rectangular, triangle, sector and other special shapes. 1. Sample and quoted prices are available if required. Prompt delivery is promised. 2. We provide custom services. For your non-standard products, we are able to produce them in our own factory within a short term. 3. Our tungsten carbide substrates are manufactured based on ISO standard with high toughness, wear resistance and precision. 4. Tongyi PDC substrates have passed the certification of quality management system. We have strict quality control and assurance system to guarantee the consistent quality. Established in 2002, Zhuzhou Tongyi Industry Co., Ltd. has been focusing on producing carbide products for more than ten years. Our products are very well received by major manufacturers. 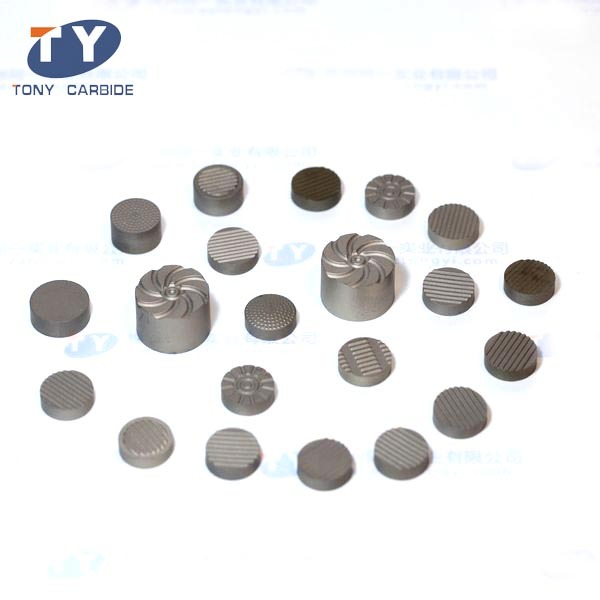 Typical carbide products include tungsten carbide substrate, tungsten carbide button, carbide drill bit, carbide die, carbide ball, carbide nozzle, etc. Over the years, our products have been exported to many countries, such as Vietnam, Indonesia, Poland, Ukraine, the United States, Brazil, etc. Our carbide PDC substrates can be made in both standard and custom configurations.